Clarifying that any information of people who are still alive will remain anonymous, the President of the United States, Donald Trump, announced that he would reveal more than two thousand files related to the investigation of the assassination of President John F. Kennedy in 1963. "After a strict consultation with General Kelly, the CIA and other agencies, I will be releasing ALL the JFK files," wrote Trump on Twitter. According to the documents, the CIA considered a plan with the Italian mafia to assassinate the then president of Cuba Fidel Castro. The report says that Attorney General Robert Kennedy told the FBI that he had learned that the CIA hired an intermediary with the proposal to pay $150,000 to hire a person armed to go to Cuba and kill Castro. The report states that Justice Secretary Kennedy said the CIA should never use mob people without first talking to the Justice Department "because that would make it difficult to prosecute those people in the future." 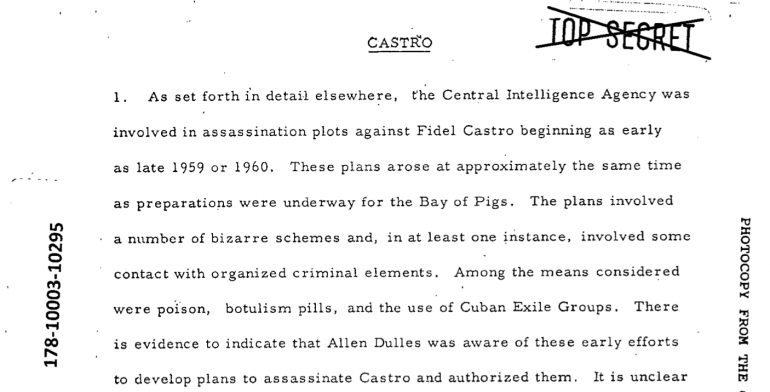 The documents also reveal that the CIA was interested in using mobsters to poison Castro with a pill. The Washington Post informed that not everything in the most recent National Archives release was recycled material, comparing the newly unclassified files with the Senate’s Church Committee document called “Alleged Assassination Plots Involving Foreign Leaders.” The report includes alleged assassination plots against Patrice Lumumba in the Congo, Rafael Trujillo in the Dominican Republic, and Castro. “We have found concrete evidence of at least eight plots involving the CIA to assassinate Fidel Castro from 1960-1965. Although some of the assassination plots did not advance beyond the stage of planning and preparation, one plot, involving the use of underworld figures, reportedly twice progressed to the point of sending poison pills to Cuba and dispatching teams to commit the deed,” reads the Senate’s Church Committee file. The report corroborates the National Archives revelations, like the Operation BOUNTY, which targeted Cuban communists. The plan consisted on "killing or delivering alive known Communists,” with rewards ranged from $5,000 to $100,000. The kill-for-pay plan never happened but shows how the United States, in numerous occasions, attempted to assassinate Castro.